Carbon dioxide emissions from burning fossil fuels in the United States peaked at more than 1.6 billion tons of carbon in 2007. Since then they have fallen 11 percent, dropping to over 1.4 billion tons in 2013, according to estimates from the U.S. Energy Information Administration. Emissions shrank rapidly during the recession, then bounced back slightly as the economy recovered. But shifting market conditions, pollution regulations, and changing behaviors are also behind the decline. Coal - the dirtiest fossil fuel - has dominated the U.S. power grid, but its grip has weakened in recent years. As the price of natural gas has fallen, utilities are dropping coal. They are also deciding to retire old, inefficient coal plants and invest elsewhere rather than pay for retrofits in order to meet increasingly stringent pollution regulations. Strong grassroots work, too, is helping to close the curtain on coal even faster. The Sierra Club's Beyond Coal campaign, which coordinates efforts across the country to retire old plants and prevent new ones from being built, tallies 149 coal plants that plan to retire or switch fuels out of more than 500. As falling natural gas prices, pollution regulations, and shrinking electricity demand reduce coal use, U.S. carbon emissions from coal have fallen 20 percent from their peak in 2005. But electricity does not have to come with a huge carbon hangover. Wind and solar power - carbon-free energy sources with no fuel costs - have been taking off. U.S. wind power capacity has more than tripled since 2007 and now produces enough energy to power over 15 million homes in the United States. Solar power capacity, starting from a smaller base, increased 14-fold in the same time period. Although wind and solar power currently account for only a small share of total energy production, their prices will continue to drop as deployment increases. In some areas wind is already cheaper than coal. This is just the beginning of reductions in carbon dioxide emissions as the explosive growth of wind and solar power cuts down the use of dirty fossil fuels. The switch to renewables cannot come soon enough. 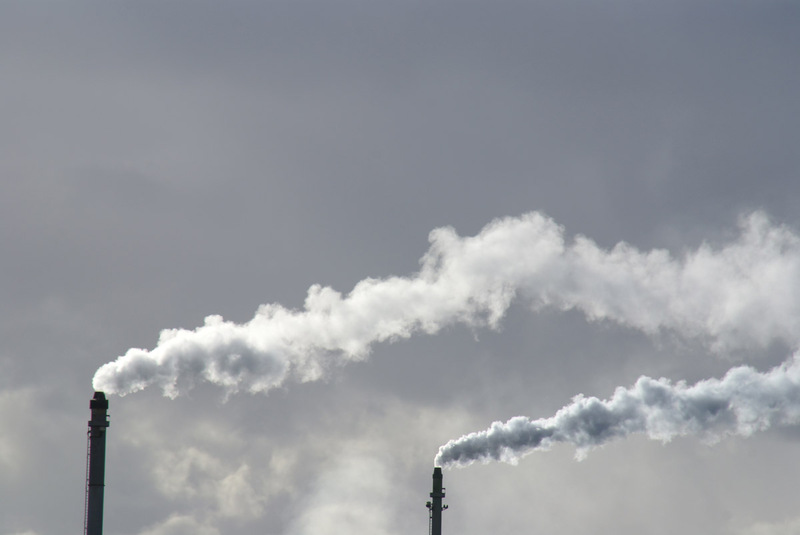 Accumulating greenhouse gas emissions from the United States and other countries have led to a global temperature increase of 1.4 degrees Fahrenheit (0.8 degrees Celsius) since the Industrial Revolution. Higher emissions will lead to higher temperatures that will bring more heat waves, melting glaciers, and rising sea levels. In 2009, President Obama set a goal of cutting greenhouse gas emissions to 17 percent below 2005 levels by 2020. Putting a price on carbon would help accelerate the trends that are cutting the United States' carbon contribution and allow the country to exceed this goal. By Emily E. Adams. For more information on the U.S. transition to wind power, see "Iowa and South Dakota Approach 25 Percent Electricity from Wind in 2012," by J. Matthew Roney.